A common question that I'm asked as an estate planning attorney is how to obtain a copy of a deceased person's last will and testament or other probate court filings. Because probate records are public court records that anyone can read, if a will has been filed for probate then you should be able to obtain a copy of it. And with modern technology comes the ability to locate information about a deceased person's estate online, and in most cases for absolutely free. But while you may not be able to view copies of the actual will and other documents that have been filed with the probate court for free (many courts have started charging for the ability to view documents), at the very least you will be able to see a list of the documents that have been filed, who has been named as the executor of the estate, which attorney the executor has hired, and the name of the judge presiding over the case. Appearing in person and asking for a copy of the will or other probate document, or making a written request by fax or mail if applying in person is not feasible. If the estate you are interested in is being probated in the Leon County Circuit Court located in Tallahassee, Florida, then follow the links and instructions provided below to view the Leon County probate court dockets online. Other cities located in Leon County include Bradfordville, Capitola, Fort Braden, Meridian, and Woodville. There are two ways to access Leon County court records online, via the county government's website and the county clerk's website. Instructions are provided for both websites. 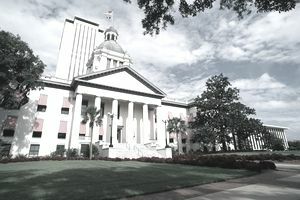 Click on the following link for the website for the Leon County, Florida government website: Leon County, Florida's Capital. In the middle of the page, click on Access Online Services. Under the "Court Records" section, click on Search Court Database. Enter the decedent's name as indicated and then click on "Search." Once you locate the link to your probate case, click on the case number. You can then click on the various tabs to view the following information: personal representative(s); attorney(ies) for personal representative(s); list of beneficiaries; list of court events by date; complete docket by date; and court costs paid. Click on the following link for the website for the Leon County, Florida clerk's website: Leon County Clerk of Courts. In the middle of the page, click on Search Your Cases. Once you locate the documents you want to have copied, you can to the county clerk's home page, scroll down to the bottom of the page and you will find all of the clerk's contact information. You can then visit the clerk's office in person or give them a call to determine the procedure for obtaining the copies and the costs involved.